Telling apart two $10 California Chardonnays is usually a matter of quality rather than regional style. At that level grapes are very likely to have been combined across several regions. Chardonnays costing $35 per bottle retail, however, are much more likely to start revealing regional signatures. Napa, Sonoma, and the Central Coast all offer different characteristics, and separate styles. Napa’s Chardonnay signature is usually penned by the winemaker. Napa grown Chardonnays are blockier, the least fruit driven, and the most dependent on winemaker intervention to make a statement. One often gets the impression Napa winery owners spend a lot of money on new barrels, then feel a need to use them a lot to get their money’s worth. Delicacy is seldom their watchword. Which is not to run Napa Chards down. Believe me, Napa Chardonnay has plenty of fans, and producers of it are so busy ringing the cash register, they won’t even notice if I choose a bottle from elsewhere every now and then. Rombauer is an ideal Napa brand with which to illustrate. Rombauer’s Chardonnay is slathered with buttery MLF, and the marketplace loves it. A small number of detractors claim all wines made that way taste alike. But, if it ain’t broke…? Sonoma and Central Coast Chardonnays are another matter. Terroir can be found among them. Both regions are predominately coastal in nature. Central Coast soils have a higher pH than those of Sonoma, and receive less rain. Overall, Sonoma Chardonnays show a lemony citrus note. They have good natural acid, which confers a long, rapier-like, palate cleansing finish. In several locations the wines have a strong mineral backnote (cf: Sonoma-Cutrer’s Les Pierres). That sharp, focused style stands in contrast to the rounder, more gentle, denser middle of Central Coast Chardonnays. Monterey confers a pineapple note, while Santa Barbara confers a more tropical note with hints of banana. Edna Valley in SLO County gets a bit of grapefruit aroma if fermented at cool temperatures. Due to increased hang-time, all Central Coast Chardonnays seem supple and apple-cheeked compared to the more incisive and structured nature of their Sonoma counterparts. Both groups age nicely, but the Central Coast wines are luscious right from release. Whenever one tastes red Burgundy in a blind line-up with Pinot Noirs from California and from Oregon, it is hard to avoid the conclusion that California is the ripest, Burgundy is a little under-ripe, and Oregon is pretty much in the middle. Of course when the topic is a grape variety about which great diversity is the first word out of anyone’s mouth, the type of broad generalization I just made sounds like the referee’s instruction to “wrestle.” Surely examples can be found which refute the fundamental premise. True, but the Central Coast is not a good location to seek Pinot Noir with less concentration and less fruitiness than routinely found in Oregon. Central Coast PN is not muscle-bound, but it is substantial. Because of their tremendously long hang-time, the Central Coast is always going to produce strongly aromatic, deeply flavored Pinot Noirs. That is not a Burgundian style. It is a successful, attractive California style. Oregon talks Burgundy-style, but drinks California-style. A prevalence, or lack, of rain in the Willamette Valley during harvest creates a pronounced style difference from vintage to vintage, some riper than others. If Oregonians truly loved Burgundy, rather than merely coveting its name recognition, they would be less star struck by warm, dry, ripe vintages. They get a Central Coast type vintage three years out of ten. They always consider those to be superior vintages. 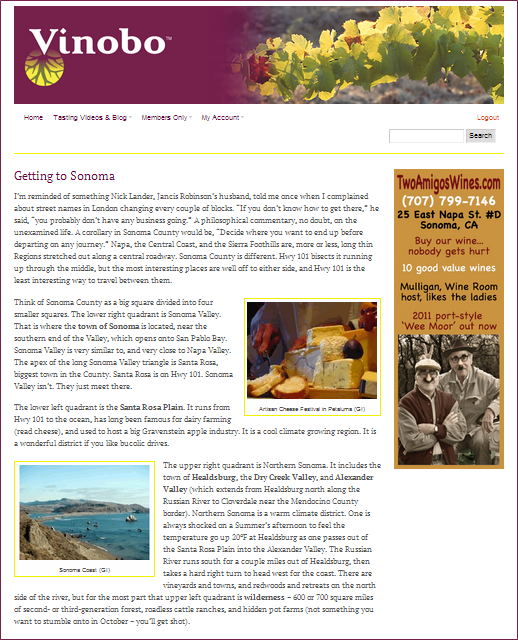 Sonoma is, by and large, more similar to Oregon than it is similar to the Central Coast. Again, all generalizations about Pinot Noir are doomed to die from a thousand tiny discrepancies, but on average Sonoma Pinot Noirs from the Santa Rosa Plain benefit more from complex bouquet and drawn out finishes than from fruit weight in the mid-palate. To make matters more confusing, Sonoma Pinot Noirs from the Ft. Ross AVA (ridge tops north of the Russian River, but close to the coast) tend to get ripe early because they are above the fog. Jamminess and alcoholic strength are not the same as “fruit weight in the mid-palate.” The Central Coast, particularly Santa Barbara County, is capable of achieving concentration of fruit flavors without an increase in extract and alcohol. That is a valuable trick. One other exception to these broad observations. The Salinas Valley in Monterey County gets a tremendous amount of wind, usually in the afternoon late in the growing season. Vineyard location, specifically whether it is protected from the wind or not, has a gigantic effect on wine style. Pinot Noir grapes from the Santa Lucia Highlands AVA are definitely subject to this caveat. If they are exposed to the wind, they are much more likely to have strands of dill weed woven through their aromatics (“very Dujac-like” is how my Canadian wine judge friends put it), and the wines never really show that ‘center ball of compressed fruit’ I keep attributing to the Central Coast. The Willamette Valley in Oregon, and the Okanagan Valley in British Columbia are both wonderful producers of Pinot Gris. In most instances producers there do call the wine by its French name rather than its Italian one. Perhaps coincidentally, the wines are much fruitier, in the Alsatian style than they are similar to the acid-driven Italian style. Both Northwest regions have been making Pinot Gris for 35 years. It is reasonably priced and reliable. I’m a huge fan. Neither Oregon nor Okanagan get much of the Alsatian plasticizer-like minerality. So it might be fair to speak of a New World style: fruit-driven, refreshing acid, low minerality in the finish. That description would hold for Oregon, Okanagan, and for California’s Central Coast. In fact it would give the Central Coast a useful model to emulate and to compete against. There is not much competition at present between up-state New York and California on the subject of Riesling. Neither place produces enough wine to impinge on the other’s shrinking market. But it is worth mentioning in this age of Internet wine sales that Hermann Wiemer and a handful of other producers in the Finger Lakes do an excellent job with Germany’s favorite grape. Of course they get cold Winters, and a short growing season. But the very deep, glacier-carved lakes (Wiemer is on Seneca Lake) modulate the temperature somewhat and grapes have been grown in the area for 185 years. The Finger Lakes are similar to northern Michigan and to the Niagara Peninsula in Canada when it comes to Riesling. California’s Central Coast makes a completely different style of wine. The Finger Lakes style, like Germany’s, is under-ripe with very high acid. Made dry, it is more than a little austere. The best examples leave 2% or 3% residual sugar to soften that dental drill of acid, which would otherwise completely dominate the wine. That style is similar to what California does up in the Sierra Foothills. Central Coast Rieslings, by contrast, have enormous fruit. They seem sweet, even when they have no residual sugar, because they smell like nectarines. Hence they should be made almost bone-dry. All the better to pair with food. They match very nicely with Indian cuisine or with dishes from the Malay Peninsula (read Singapore). They are also great with melon and something salty (nuts, chips, ham). The Paso Robles AVA in San Luis Obispo County is something of an anomaly on the Central Coast. It does have lots of carbonates (compressed shells) in the soil because of the soil’s seabed origin, but it is not really a maritime climate. It is on the inland side of the coastal mountains, and it gets hot. Big diurnal fluctuation is what takes it out of the maritime category. Paso Robles shares these characteristics (more or less) with the southern end of the Salinas Valley, south of King City. These areas specialize in Rhône varieties, in Zinfandel, and in Cabernet which can be drunk with pleasure early, in no small part because it tends to be priced modestly. As such, these areas draw immediate comparison to the Alexander Valley in northern Sonoma County, to the Redwood Valley around Ukiah in Mendocino County and to the newer areas planted in Lake County. The Paso Cabs have a higher pH than one would expect to find in Napa Valley. That is partially because of the higher pH of the soil due to carbonates, but it also reflects a very warm climate in which grapes are allowed to get very ripe fairly quickly. The price is indicative of the easy growing conditions: deep fertile soils, with lots of water available from the underground Salinas River. Growers can shoot for high tonnages. Land prices are modest because of the distance to Los Angeles or San Francisco. When bidding for 100 acres, the competition is much more likely to be an alfalfa farmer than it is a home builder. High pH and tonnages per acre in the range of 6 or 7 make for Cabernets with chocolatey overtones, soft tannins, and mouth-filling body. Great with a thick-cut beef tri-tip rubbed heavily with spices, then cooked quickly over hot coals. Serve with new potatoes and broccoli. Pay between $10 and $20 per bottle for the wine. Purchase it by the case. Don’t hang on to a few bottles to see how they’ll age. Drink it all now. Rinse. Repeat. Zinfandel is another matter. Zinfandel has been produced on the Westside of Hwy 101 in Paso Robles with great quality since the era of Ignace Paderewski (1850-1941), the pianist and Polish Prime Minister who owned 2,000 acres there. It just never sold for very much money. Like the Sierra Foothills and Sonoma County, the wonderful old Zinfandel vines in Paso Robles were planted by Italian immigrants who arrived between 1900 and 1910. It is only since the mid-1990’s that these wines have sold for double figures. That opportunity has allowed the enormous potential of these vines to emerge for public scrutiny. In the 1970’s one had to go buy the wines in gallon jugs at multi-generational wineries like Pesenti. I bought a lot of them. You had to fight through layers of primitive winemaking to find the extraordinarily concentrated core of boysenberry (read varietal) flavor, but it was always there. Today Larry Turley makes the quality much more easily accessible, but charges you $50 a bottle to try it. In Amador County that same characteristic is refined by a metallic gout de terroir that seems to come from iron-rich soil found in the Foothills. In Sonoma, the characteristic is more about stewed fruit and hard tannins. In Paso it is spicier, more peppery aromatic notes, and the extract is softer, more malleable. The most widely exploited vinous category taking advantage of Paso Robles’ unique wine growing conditions would be Rhône varieties such as Grenache, Syrah, and Mourvedre. This is also true in northern Sonoma County, and in the Sierra Foothills. For that matter it’s true in Monterey County and in Santa Barbara County too. One of the state’s most successful practitioners is John Alban, who is in San Luis Obispo County, but in the cool South County district of Edna Valley. Clearly there is nothing about GSM varieties that precludes cool California districts. Grenache will have some problems, unless tonnage is severely restricted, because Grenache wants to get ripe in order to show its signature raspberry aroma. Syrah is very adaptable, but it gets a strong black pepper component in the coolest sites. Paso Robles avoids both these warnings, and ten new wineries open there every year intent on producing wines to match with the Mediterranean diet. With so many practitioners of the Rhônish arts, it stands to reason there will be a period of adolescence as the marketplace works out what the standards and styles for individual California districts should be. That hasn’t happened yet. Each new winery owner brings his or her own ideas, eager to subject them to the heartless reviews of American consumers. It’s natural selection, jungle-style. You should find the process fascinating. It will take years to clearly see winners and losers among the stylistic competitors. Vote with your feet, and your dollars. Vote early; vote often.